I’m currently at the airport, waiting to board my flight back from the Congress of the Humanities and Social Sciences in Calgary. Congress is a sort of super-conference where over 70 scholarly associations simultaneously hold their annual conventions. For those who aren’t Canadian academics, the concept might seem a bit foreign, but it works well in practice. It gives the whole event a vibrancy that many smaller conferences would otherwise lack, and it has the added benefit of making it likely you’ll run into friends in other disciplines who you might be unlikely to encounter at the conferences you usually attend. While individual association events usually have their own twitter hashtags, there is also a tag for general Congress-related twitter activity. The nice thing about this tag is that it offers insight into the social relations across a wide variety of Canadian academic fields. To get at these relations I downloaded all of the tweets that had used the #CongreSSH2016 hashtag as of the evening of June 2 (one day before the end of the event). This resulted in approximately 2900 tweets. Using these tweets, I identified all users who had tweeted using the hashtag and determined the following relations between those users. There are 1079 twitter users in the network (I removed about a dozen isolates who had used the hashtag), sharing 19,148 directed ties. The nodes are colored based on their detected community within the network. I’d be interested to hear conjecture about what the communities might represent in terms of offline relations (e.g. disciplines, geography, etc). If you click the image, you’ll be able to interactively explore the network, which is searchable by twitter handle. 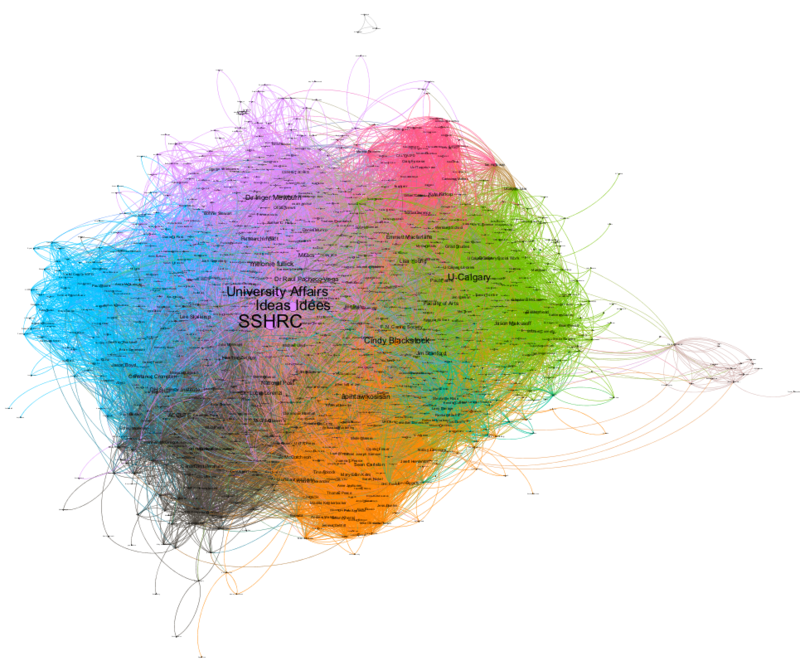 After a few requests for an analysis of the #CongreSSH hashtag, I downloaded that data as well. It took a number of days due to API rate limiting. This network is more than twice as large as the original, containing 2,391 twitter users and 56,968 following relations. Clicking through the image will again take you to an interactive network. 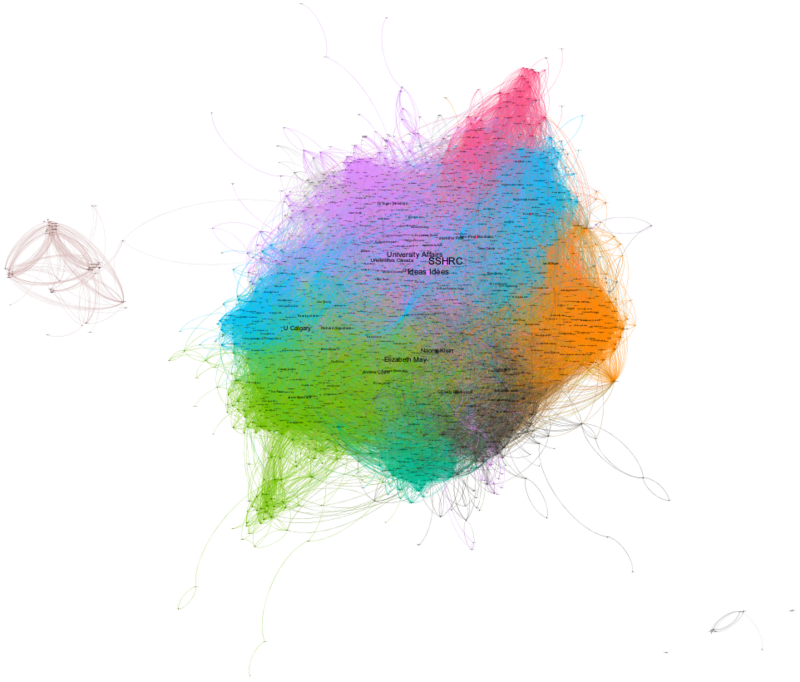 Note that the colours assigned to nodes are based on their membership in network communities, and it is purely coincidental that Elizabeth May is in the ‘Green’ community. Feel free to get in touch w/ questions or if you’d like scripts or data. This is cool; is there any way to account as well for use of the main/official Congress hashtag, i.e., #congressh without the _2016_? Absolutely. I started grabbing the data a couple of days ago. Because of API rate limits, the job is still running. I’ll post again when the data collection is complete. I’ve updated this post by adding the #congressh data.